We’d love your help. 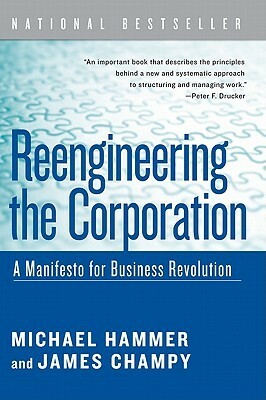 Let us know what’s wrong with this preview of Reengineering the Corporation by Michael Hammer. Michael Hammer and James Champ The most successful business book of the last decade, Reengineering the Corporation is the pioneering work on the most important topic in business today: achieving dramatic performance improvements. This book leads readers through the radical redesign of a company's processes, organization, and culture to achieve a quantum leap in performance. To ask other readers questions about Reengineering the Corporation, please sign up. This question contains spoilers… (view spoiler)[How do I download this book? This book gets five stars because it saved my business, if not my life. My business partner and I had been working 100+ hour weeks for months (I'd go home at midnight, come back at five or six and ask him if he was already back or still there - he'd typically answer "still here"). Clothes we would typically promise tomorrow were now being promised back a week from tomorrow - and they were still not done in time. It was Labor Day weekend and I was supposed to go to Hilton Head with my wife, but o This book gets five stars because it saved my business, if not my life. My business partner and I had been working 100+ hour weeks for months (I'd go home at midnight, come back at five or six and ask him if he was already back or still there - he'd typically answer "still here"). Clothes we would typically promise tomorrow were now being promised back a week from tomorrow - and they were still not done in time. It was Labor Day weekend and I was supposed to go to Hilton Head with my wife, but our dry cleaning plant manager ended up in the hospital and the cleaning duties fell to me. Our main cleaning machine suffered a major malfunction, putting us even further behind. I ended up calling on a fellow friend in the business to let me use his equipment. I could go on and on (my wife called on Labor Day to tell me about this great unknown band she'd seen the night before at the last show ever at the famed HH post office by the name of Hootie & the Blowfish - that didn't make me feel any better). Данная книга входит в список 100 лучших бизнес-книг всех времен по версии издателей бизнес литературы Джека Коверта и Тодда Саттерстена. Обычно книги из данного списка вызывают либо несомненной удовольствие либо же восторг от данных книг, и очень редко достаточное удовлетворение. Эта же книга по моему усмотрению попадает под первый вариант. У авторов стояла цель показать, что такое подлинный реинжиниринг для компаний или части их процессов, а не одна лишь его видимость. Это не только получилось, Данная книга входит в список 100 лучших бизнес-книг всех времен по версии издателей бизнес литературы Джека Коверта и Тодда Саттерстена. Обычно книги из данного списка вызывают либо несомненной удовольствие либо же восторг от данных книг, и очень редко достаточное удовлетворение. Эта же книга по моему усмотрению попадает под первый вариант. У авторов стояла цель показать, что такое подлинный реинжиниринг для компаний или части их процессов, а не одна лишь его видимость. Это не только получилось, но и доказало, что данную процедуру нужно внедрять в обязательном порядке с определённой цикличностью. Este libro describe la metodología para reinventar una empresa a través de sus procesos, pensándolos desde cero. Promete resultados fantásticos (mejoras del rendimiento superiores al 100%) pero advierte también que la mayoría de proyectos de reingeniería fracasan (y cuenta por que suelen hacerlo). The first half of the book is a good and insightful read into how to make radical changes. But after some point it becomes a bit redundant. Overall a good read for those looking to bring about changes in existing companies and their systems and procedures. Um dos primeiros livros de negócios que li. Fez muito sentido na época. Abusaram da fórmula. A turma de BPM deveria conhecê-lo. Short, sweet, and to the point. Has some good ideas, less specialization and more efficiency. - A lot of ideas are taken from toyota lean (value-stream, value to customer, etc.) but not explained clearly. Business is all about taking the right risk for profits. Business is run by people and needs processes and guidliness for controls. Business processes needs reengineering based on the organisations vision and appitite. 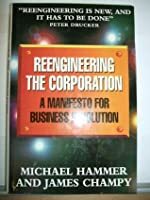 The reengineering the corporation provides key insights on how to redevelop or redesign the business process so that the purpose and value is achieved based on the customer needs. I found the following as the key from the book. - Reengineering Business is all about taking the right risk for profits. Business is run by people and needs processes and guidliness for controls. Business processes needs reengineering based on the organisations vision and appitite. The reengineering the corporation provides key insights on how to redevelop or redesign the business process so that the purpose and value is achieved based on the customer needs. I found the following as the key from the book. -	Reengineering is the opportunity to develop the rules by which business in the future will be conducted rather than being forced to operate by the rules imposed by someone else. -	Reengineering is defined as the fundamental rethinking and radical redesign of business processes to generate dramatic improvements in critical performances measures such as cost, quality, service and speed. o	Companies with mangers who are ambitious and aggressive. -	Companies enjoy the benefits of centralized purchasing power and decentralized operations. -	Reengineering is not solely about creating a new business processes it focuses on creating a new company by Simplifying the process | empowerment of people through range of tasks to perform | moving from hierarchy to a flatter management run by professionals and not managers | People in the organisation no longer worry about pleasing the boss but focus on pleasing the customers. -	Business process exist solely for the purpose of creating a satisfied customer – Always start with customer and work backward. -	Reengineering must be done at speed – the faster the better. I have already finished this lecture and it is interesting from the beginning to the end; I had learn new things, concepts and strategies that can be useful for the company where currently I work in; and seeing the examples and errors in processes, there is big desire to have the chance for being part of a reengineering implementation here. It is a very good tool to have in mind even in personal life. A very good book that describes the difference between continuous process improvement and reengineering (or building a process from scratch). The business examples were useful as were the "reason for failure" chapter. I would love to find a good book on how to build a learning game like the one discussed in the IBM example. A simple and quick recipe for how to re-work your cooperate work. Not really fully applicable to all sorts of corporates, yet it gives you a better insight for the big picture. I think its a must read for anyone interested in such topics. This was my pocket reference guide when I ran into major challenges transforming Fortune 500 processes from out of control to simply flowing with improved working climate. Timeless too. Any Michael Hammer book is worth checking out. I have also read Beyond Reengineering.